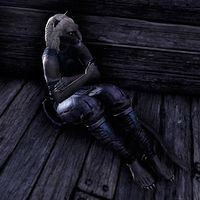 Dimarra is a Khajiit dweller of Alten Corimont who can be encountered on board the Blasted Breton (Fighters Guild side). If spoken to, she shares with you her fears: "Dimarra hopes the Dominion goes home soon. Too many eyes have seen this one. Someone from Tenmar will find this one. No, let it not be so!" This page was last modified on 22 February 2018, at 08:00.